Happy Sunday! I hope everyone had a great, relaxing weekend:] I slacked off yesterday and went to a park and museum, so now it's crunch time for finals :/ ahh well, better than writing papers! I also restocked the Etsy shop last night, go check it out! 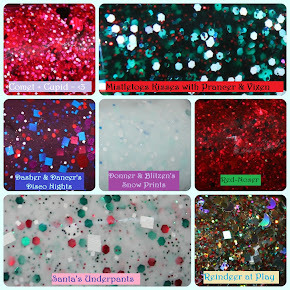 There's still some LE polishes left:] Today, I have another indie seller for you! I haven't seen any reviews of this seller [BAM Nail], but I took a chance and ordered a polish, Galactic Gateway. It looked more minty in the Etsy picture, but it's definitely more a light blue color in person. I think my pictures are pretty color-accurate. Anyway, there's varying sizes of silver glitters in this plus tiny orange glitter and super small blue bar glitters. You can really see them in the close up below! I wore this at 2 coats. I LOVE the amount of glitter you get in this polish! The formula was great, too, not too thick. And I'm having a moment with milky glitters and neon glitters, so it went into love category in my head already. Plus, it really looks layered and like it has depth, which I'm crazy about. I'm not generally too crazy about bar glitter, but I do like it in this, I think it adds something unexpected to the polish, especially since it's so teeny and cute! What do you think of BAM Nails? For my first experience, I like this a lot. Good luck with finals :)This polish looks gorgeous on you! oooh, i've never seen that one! Wow this is a beautiful polish! I love the tiny copper glitter!